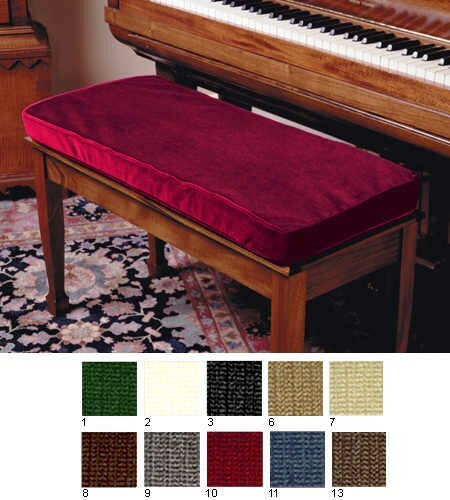 2" Polyester Satin Bench Cushion - FREE S&H is rated 4.36 out of 5 based on 36 ratings. Add beauty and sit comfortably and your kids will practice longer! Check out our most popular bench cushion - a 2" box cushion (also available with 3" booster foam) with a new wear resistant polyester satin material. It really stands up to years of sitting down. Designed with two single perimeter welts and three matching ties on each side so the cushion stays put. Choose from 13 colors and 6 sizes. NEW! You can now have us make a custom-size cushion to perfectly fit your any bench in your home! Please call customer service at 800-792-4457, or order a custom size by going to our other item 30070_C.